Just added to the Sarasota County Water Atlas are two new features designed to keep the public informed about environmental monitoring efforts by the County to ensure good water quality. 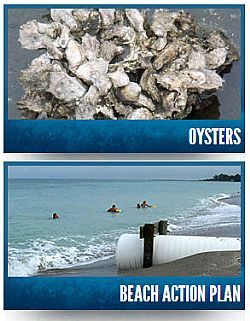 The new Oyster Mapping & Monitoring section of the Atlas has general information about the eastern oyster,Crassotrea virginica—its life cycle, how it affects and is affected by water quality, global threats and restoration efforts—and describes the habitats and locations where oysters may be found in Sarasota County's bays and creeks. The results of two different monitoring efforts are provided: one of these mapped the types and location of oyster habitat, and the other monitored the health of oysters in different locations in the County. The interactive map provided graphically displays these results. The section also has links to research papers and websites with information about oysters and how environmental managers around the world are working to restore their habitat. Also new is the Beach Action Plan page. It describes the efforts of Sarasota County and its partners (the Sarasota and Manatee County Health Departments, the Town of Longboat Key, the Cities of Sarasota and Venice, and the Englewood Water District) to establish an "Action Plan" to minimize adverse human health impacts from bacteria exposure and avert "No-Swim Advisories" at County beaches. The project produced individual "sanitary surveys" for 16 area beaches that map potential sources of water contamination; project partners monitor these regularly to ensure swimmer safety. You can view the survey maps, read the full "Beach Bacteria Incident Action Plan", see photos of the beaches, and find out about beach amenities on this useful page. Also provided are links to research papers and websites about beach water quality and monitoring.